According to Mark Wintch, a farmer in Nevada, “If I put my cows out here they will starve” (Philipps, 2014, para. 3). Farmers play a key role in producing food for all of us to eat. This difficult job of ensuring that there is sufficient land and food for their animals shouldn’t come with any more obstacle, but their job gets even harder with the increasing population of wild horses. Feral horses pose numerous threats to not only United States ecosystems, but also to those using public lands for agricultural purposes. Although horses impact farmers, it is difficult to manage them because they are considered a charismatic or iconic species in many places including the United States (Bhattacharyya, Slocombe, & Murphy, 2011). A charismatic species is one that humans place a unique value upon in regards to cultural, historical or personal significance, or based on aesthetics. In places like British Columbia, horses pose similar threats, yet management actions became restricted due to political and cultural values placed on horses due to historical significance (Bhattacharyya et al., 2011). Even though a majority of American society admires feral horses, wild horses still degrade soil and destroy vegetation cattle farmers use to feed their animals. This problem of limited space and vegetation for cattle will only get worse as horse populations grow. Without proper management, the horse population may near 100,000 wild horses by 2019-2020 (Philipps, 2014, para. 7). Since feral horses share 60-80% of the diet of cows, an increase of horse population will affect a farmer’s life even more (Beever & Brussard, 2000, p. 238). Mark Wintch now needs to import his cattles’ food from elsewhere because he can’t put cattle out on pasture due to destroyed land (Philipps, 2014). Today, 155 million acres of land gets leased out to cattle farmers, which is nearly 25% of the total 640 million acres of United States public land (Bureau of Land Management [BLM], n.d;Vincent, Hanson & Argueta, 2017). Feral horses inhabit approximately 34 million acres of grasslands and fields on public land in Montana, Idaho, Nevada, Wyoming, Oregon, Utah, California, Arizona, North Dakota and New Mexico as well the Shackleford, Sable, Assateague, and Cumberland Islands (Bradford, 2014). Farmers can lease public land and increase their contributions to the economy when horses reach a manageable population size. Feral horses in the United States are causing approximately five million dollars in damage to the United States ecosystems’ vegetation (Pimentel, Lach, Zuniga, & Morrison, 2000, p. 54). Since these animals do not belong to any organization, people or group, they are not contributing to the economy and only inflicting ecological damage. In contrast, farmers who use federal land to graze are required to pay the Forest Service or the Bureau of Land Management for leases and permits to graze. Feral horses pose an economic threat as they are causing only damage to vegetation found on public lands and contributing nothing. Horses follow no invisible boundary where one farmer’s land ends and another begins, which is one of the reasons why feral horses negatively impact cattle farmers in the United States. Cattle farmers are forced to sue the government just so that the feral horses get removed from the land that they lease. Farmers are even encouraged to “voluntarily” reduce their herds to half of their original size just so that they can keep up with the damage done by feral horses on grazing land (Philipps, 2014). There has been a long history of horses in our country. While interwoven with United States culture, their ecological clash negatively affected the United States’ ecosystem. Horses were introduced to North America by Spanish explorers in Mexico during the early 1500s and slowly roamed northwards into the American heartland (Kirkpatrick & Fazio, 2010). Horses overpopulated these areas because of the lack of natural predators coupled with an abundant amount of grassland (Bradford, 2014). Currently, the government wonders what’s the best way to combat this overpopulation. Managing these horses needs to become a bigger focal point for federal regulators. For proper management of wild horses, the United States government must classify wild horses as an invasive species. The definition of an invasive species is an organism that causes ecological harm where it isn’t native (National Oceanic and Atmospheric Administration [NOAA], 2017, para. 1). Horses fit this definition as they affect the U.S ecosystem while they originally came from overseas. The federal government does not define horses as an invasive species, but is currently under growing pressure to add horses to the invasive species list. Due to the dwindling wild horse population in the 1970s, wild horses were initially protected by the Horse and Burro Act of 1971, but with added protection the wild horse population exponentially grew and caused dramatic impacts to the United States ecosystem (Committee to Review the Bureau of Land Management Wild Horse and Burro Management Program, 2013, p. 15). These horses are feral and a nuisance to ranchers because of their effects on prairie grasslands, which in turn limits the amount of food for cattle. Before the Horse and Burro Act of 1971, there was growing widespread public concern about the wellbeing of horses (Committee to Review the Bureau of Land Management Wild Horse and Burro Management Program, 2013, p. 15). Unlike the current state of feral horses where they are viewed as a nuisance, wild horses used to have a declining population. Horses died due to livestock competition and roundups, where the horses were sold for slaughter (p. 15). The public looked for a way to provide a more stable environment for these creatures. The Wild Horse and Burro Act was established in 1971, giving horses allocated federal lands to roam and graze (National Wild Horse and Burro Program, 1971). The act entails the difficult process of controlling the horse population. Horses have no natural predators and under such circumstance reproduce rapidly (Bradford, 2014). The legislation makes it illegal to harm or kill horses on Federal land (National Wild Horse and Burro Program, 1971, Sec. 8). While the act seemed great at first, it became clear that there was far too many horses for the allotted land. Updated legislation includes the Stewart Provision, a law enacted in Utah that relocates horses to greener pastures to save the ecological integrity of the rangeland (St. George News, 2016). This is a good idea to start, but there are way too many horses for relocation. The number of horses needs to decrease by 32,768 to meet the target for manageable rangelands (Bureau of Land Management [BLM], 2017a, table 1). The government has recognized the issue of feral horses with legislative measures, but more action needs to be taken to effectively reduce their numbers and stop their negative impact on the United States Ecosystem. United States ecosystems have suffered immensely due to the presence of feral horses over the years. Soil quality is an important and influential factor for successful agriculture. The overpopulation of feral horses degrades soil quality in different ways. Due to trampling the soil around watering holes or common grazing sites, horses impacted the soil (Davies, Collins, & Boyd, 2014). In an experiment done by Davies, Collins and Boyd (2014), areas used for research were defined by exposure to feral horses; horse exposed or horse excluded. In areas where horses were excluded and not grazing, the soil stability was 1.5 times greater than horse exposed areas (p. 127). In horse excluded areas components of the soil, or soil aggregates, became more resistant to naturally occurring causes of erosion such as rain or wind. In horse exposed areas, the amount of force required to penetrate the soil was 2.5 times greater than in areas not exposed to horses, showing that high concentrations of feral horses compact the soil to a significant level (Davies et al., 2014, p. 127). Due to the presence of horses, horse included areas are at a higher risk of erosion due to degraded soil quality (Davies et al., 2014). Erosion directly impacts agriculture as it removes the top-soil, the most productive and important part of the “soil profile” for agriculture (Queensland Government, 2016). Feral horses degrade soil quality and thus inhibit agricultural productivity. With increasing soil compaction due to high densities of feral horses, vegetation is unable to penetrate the soil and grow. This leads to greater areas of bare soil exposure (Zalba & Loydi, 2014). There is a high correlation between proximity to a horse dung pile and the amount of bare ground exposure likely due to the horses trampling areas where dung piles are found causing vegetation to not grow (Zalba & Loydi, 2014). Additionally, in areas that feral horses had access to, the amount of bare ground exposure was 7 times greater than in horse excluded areas in regards to riparian vegetation (Boyd, Davies & Collins, 2017, p. 413). This signifies that with a high density of feral horses present in an area, less vegetation can grow and thus more exposed soil is seen. Agriculture is affected by the presence of horses because vegetation cannot grow in such compacted and eroded soil. Along with a markedly lower amount of vegetation, presence of feral horses negatively affects the species diversity of vegetation. Low soil quality and increased bare ground exposure decreases the ability of vegetation to grow which negatively impacts species diversity among vegetation. Plant species diversity was 1.2 times greater in horse excluded areas as opposed to horse included areas (Davies et al., 2014). With less vegetation present to hold the soil together and absorb moisture, the soil becomes more susceptible to water inundation and thus erosion. Horses have the ability to degrade habitat quality over time by altering the seed stock and lower the carrying capacity of the soil for vegetation (Turner, 2015). The ability of vegetation to grow and the type of vegetation is important for ranchers as cattle require grasslands to graze (Philipps, 2014). The overpopulation of feral horses can significantly impact vegetation growth due to overgrazing and compacting the soil thus taking away resources needed for cattle farming. The overpopulation of feral horses negatively impacts United States ecosystems along with cattle farmers. As of March of 2017, there is a population of 59,483 wild horses in the United States which is an 8% increase from 2016. The wild horse population constantly trends upward due poor management techniques (BLM, 2017a). This population size is gravely too high and needs to decline to a manageable population of 26,715 (BLM, 2017a). If horses get managed properly, then the impact wild horses have on the United States ecosystem will decrease (para. 1). Horse management practices such as adoption and fertility management were used in the past, but proved unsuccessful in reducing horse populations. In the early 2000s, horses were captured and brought to Bureau of Land Management holding facilities which succeeded in making a 2:1 ratio of horses in the wild to animals removed for adoption (Committee of Bureau of Land Management, 2013, p. 16). From the total population of horses in these facilities, only around 4%, or 2,912 horses, were adopted out (BLM, 2017b; BLM, 2017a). The number of horses adopted is low because most of these horses are labeled as “unadoptable” and strict guidelines prohibit people from adoption. Unadopted horses can’t be sold out for adoption because of uncontrollable or tamable behaviors and age (Columbia Broadcasting System/Associated Press [CBS/AP], 2008, para. 8). In 2008 when there were 32,000 horses in captivity, between 500 and 2,500 horses got labeled as unadoptable (CBS/AP, 2008, para. 6-9). This means that there is approximately 2-8% of the horse population that are unadoptable. Unadoptable horses or horses waiting to get adopted get brought to long term holding facilities where they are provided proper care, but uses a tremendous amount of government funding (Committee of the Bureau of Land Management, 2013, p. 212). Although there was success with capturing, there was little success with getting the horses adopted out. 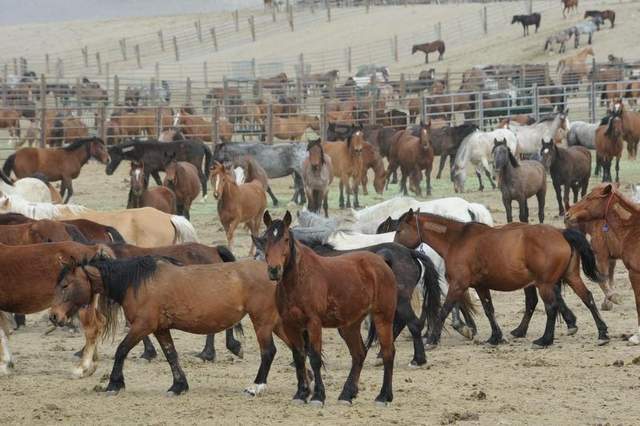 In 2012, there were still 45,000 horses in holding facilities which used 60% of the Wild Horse and Burro budget (Committee to Review the Bureau of Land Management Wild Horse and Burro Management Program, 2013, p. 16). This totals close to $40 million dollar per year to maintain these horses (Committee to Review the Bureau of Land Management Wild Horse and Burro Management Program, 2013, p. 301). This would mean allotting around $900 per horse already in captivity per year. If more holding facilities got built to store the approximately 33,000 horses needed to be removed for manageable amount in the wild, it would cost the U.S. nearly $30 million extra. This process would cost nearly $70 million per year. Not only are adoptions bad for the economy and inefficient, capturing and transporting increases horses stress levels (Independent Technical Research Group, 2015). Stress and proper handling was measured on live horses in Australia using different management techniques. The levels were measured based on human interaction with the horses and the time it took for the management technique to take place per horse. According to studies performed on wild horse populations in Kosciuszko National Park, management practices such as trapping and transport are used to bring wild horses to holding facilities (Independent Technical Research Group, 2015, Figure 1). The study discovered that both capture and transport affected the horses’ behavior, social structure, health, and stress (Independent Technical Research Group, 2015, p. 19-22; p. 33-39). Trapping horses normally takes several hours to perform. Transport to holding facilities can take hours to days with limited food and water for the horses. Also, these horses were never handled by humans which increases the fear and stress of the animals. The stress of capturing and transporting horses to holding facilities and the economic impact of these facilities are reasons why these practices don’t manage horses properly. With a more efficient management strategy, the horse population will decrease which, in turn, will free up land and resources for cattle farmers and ranchers. Similar to capturing horses for adoption, fertility control is another method used in the past yet unsuccessful in decreasing the population to a manageable size. The two main contraceptives used are Porcine Zona Pellucida (PZP) and Gonadotropin releasing hormones (GnRH). Both drugs control the estrous cycle in horses manipulating a female horse’s (mare) ability to get pregnant (Committee to Review the Bureau of Land Management Wild Horse and Burro Management Program, 2013). Contraceptives proved unpredictable with repeated use and the difficulty of hand injections (Committee to Review the Bureau of Land Management Wild Horse and Burro Management Program, 2013, Table S-1). Fertility control also takes a while to decrease populations. When using PZP as a fertility control method, it took 6 years of annual injections for the horse population to stabilize and not increase (Fort Collins Science Center, 2017, para. 6). It then took around another 12 years to reduce the population size down from 150 horses to 115 horses (National Park Services, 2013, Figure 1). This horse population decreased by only 37% over the course of 12 years. With the current population of horses in the United States, it would take around 24 years to reduce the current population size to a manageable number. Also, PZP increases the average age of mortality for mares ( National Park Services, 2013, p. 123-124). Mares not treated with PZP contraception only lived to an average of 6.47 years while mares given PZP lived on average 19.94 years. The decrease in mortality increases the age limits of the horses. Since horses live longer, the fertility control is used for a longer period of times, and the horses still affect the environment. When trying to reduce the horse population down by around 33,000 horses, it will take a lot of time and money. The vaccine, known as PZP, costs $24 per dose and lasts for one year (Masters, 2017). The lifespan of a typical adult horse given PZP is about 20-25 years (Blocksdorf, 2017), meaning that over a horse’s lifetime birth control would cost approximately $540. Incorporating the number of horses that need to be eradicated, this would bring the total cost of the birth control method close to $18 million over a horse’s lifetime; a staggering statistic that shows fertility control isn’t a sustainable or smart choice. Not only is fertility contraception expensive to reduce horse population size, but it is also not the best method in terms of efficacy. In order for both PZP and GnRH, horses are captured and given the drug by hand or by using a dart (Committee to Review the Bureau of Land Management Wild Horse and Burro Management Program, 2013). Capturing horses then giving the horse the contraceptive is stressful for the horse. According to Kosciuszko National Park, PZP increases the desire for stallions to stay near mares (Independent Technical Research Group, 2015, p. 64-67). When mares are given PZP they become infertile, but appear receptive to male horses (stallions). This extendeds the workload for stallions during breeding seasons because they spend more time attempting to breed with infertile females. Stallions then put forth more energy to stay with the mares, which causes the stallions to become emaciated. Stallions increased reproductive behaviors by 55% when a mare was given PZP (Independent Technical Research Group, 2015, p. 64).The stallions focus more of their time on breeding than eating food. GnRH has a side effect that encourages mares to eat more vegetation (Ransom et al., 2014). Mares act infertile, allowing for increased energy use to eat more vegetation. With the use of contraceptives, horses will continue to negatively impact public agricultural land due to consuming of vegetation. Since there are so many side effects and issues with fertility control, other methods should be used to manage horse populations. Wild horse populations are very hard to manage and bring down to a capacity suitable for the United States ecosystems. Methods such as adoptions and fertility attempted in the past reached little success. The best option for horse management is culling. Culling is the systematic killing of animals for management purposes. Culling is cost effective, ethical if done properly, and reduces the horse population rapidly (Galapagos Conservancy, n.d). Across the globe, culling projects have been shown to reduce the population of invasive species. The removal of goats on Santiago island cost $8.7 million (Cruz, Carrion, Campbell, Lavoei, & Donlan, 2009, p. 1). Santiago Island had over 79,000 goats killed which meant it cost approximately $110 per goat. This amount of money can be compared to a case study on the cost of culling kangaroos in Australia. The government of Australia conducted culls with kangaroos due to their extremely high numbers (500 million) and consequent overgrazing of the land (Sosnowski, 2013). In 2013 there were 1,504 kangaroos shot at a total cost of $273,000, which averages to $182 per kangaroo (Raggatt, 2013). The data from the two case studies can help predict the cost of culling horses. This would translate to a total of $5,963,776, a substantial savings over the $18 million birth control method and $70 million captivity cost. The urgency to cull the horse population is due to the rate at which it is increasing by: doubling in size every 4-5 years (National Horse & Burro Rangeland Management Coalition, 2016). A cull seems harsh, but it’s a feasible option that is the quickest way to revert our rangelands back to their original state. Helicopters used to control the wild goat population on the Isabela islands was the quickest and least stressful way of controlling invasive populations as it allowed for the most rapid means of rounding up and killing the goats (Galapagos Conservancy, n.d). This practice works well with culling large population of horses on rangelands. According to data collected from studies performed at Kosciuszko National Park, aerial shooting was the most humane method of reducing and managing an overpopulation of wild horses (Independent Technical Reference Group, 2015, Table 1). When using aerial shooting, there is no need to capture the horses (Independent Technical Research Group, 2015, p. 11) which decreases the amount of stress on the animals. Aerial shooting involves trained shooters to target horses in smaller groups and deliver instantaneous killing head shots (Independent Technical Research Group, 2015, p. 52-59). The head shots quickly kills the horse and leads to less suffering over time for each individual horse. Aerial shooting takes an average of 73 seconds to chase and kill the horses (Independent Technical Research Group, 2015, p. 3). Aerial shooting is a quick method of reducing the population size of wild horses in a way that leads to less stress over long periods of time. Although horses are a beloved and charismatic species to the United States, the wild horses have overpopulated and in turn negatively impact the United States ecosystems. These animals degrade the soil and the ability of vegetation to growth. These issues negatively affect the lives of cattle farmers that reside in the Western United States. To combat the overpopulation of wild horses, culling initiatives should rapidly, efficiently and ethically decrease the population of horses. A culling initiative is the most effective and feasible means of combating overpopulation of wild horses. Lethal management will drastically decrease the population of wild horses in a short amount of time. Bringing the horse population down to 26,715 by the end of the year will allow the ecosystems to rebound to a more natural state (BLM, 2017a). Cattle farmers and agriculture will recover as the ecosystems bounce back from all of the years of exploitation by the overpopulation of feral horses. Your article was totally PREJUDICE towards wild horses!!!! If wild horses are invasive, so is CATTLE. They belong in Europe. The native Bovine specie in USA is the Buffalo, which White Europeans, the USA army and US railroad went and SHOT ALL 16 MILLION BUFFALO to the point of extinction to wind the WEST from the Native American Indians to drive the TEXAS LONGHORN to occuppied the western States. White Europeans are an INVASIVE SPECIES ALSO. Our PUBLIC LAND IS NOT FOR CATTLE GRAZING !!!!!!!!!!! The wild horses DO BELONG to an organization, the AMERICAN TAXPAYERS!!!. Also the cattle grazing on our public land only produced 3% of the country’s beef. rest 97% is from stingy, polluted congested filthy flies ridden FEEDLOTS !!!. Also the amount rancher pay to grazed on public land is about $22/year per cattle !!!! !, with 3% beef of the 94 MILLION cattle raised that would be 2 MILLION cattle on public land giving the government ‘WELFARE” payment of $44 million dollar/year.for use of 155 MILLION ACRES !!!! which rancher is paying $3.50 acre/per year rent !!!!!!! Also another “WELFARE” benefit to cattle ranchers is taxpayer funded killing service by Wildlife Service to killed predators; wolves, bears, mt. lion, coyotes etc. to protect rancher’s cattle..Wildlife Service killed 1.3 MILLION wildlife animals in 2017. 80% of Wildlife Service budget of $120 Million goes to killing PREDATORS, that mounts up to $96 MILLION DOLLARS!!!!. Collect $44 Million on lease, Spend $96 Millions of taxpayer’s money to protect rancher’s cattle. That Loss of $52 Million. Then to add up the cost that taxpayers taxes federal government spend on Chronic diseases; $386 Million heart disease, $286 Million Cancer, $346 Million diabetes, $186 Million Alzheimer..that $ 1,204,000,000,000, that is ONE TRILLION , 2HUNDRED BILLION in chronic disease cost. In 13 more years, out federal government will have NO MONEY for anything other than DISEASE from MEAT !!!! Also, 64% of all LAND ON EARTH that farm-able is taken to GROW FOOD FOR HUMANS !!!! ON 5% OF LAND is habitated by WILDLIFE………SO IT MY OPINION, keep your BLOODY CONSUMPTION of meat to yourself…and GET YOUR CATTLE OFF OUR PUBLIC LAND !!!!!!!!!!! !